Born on January 6th, 1706 in Milk Street, Boston, Benjamin Franklin had an internal push to want to be successful despite the challenges he encountered. He was the youngest son of Josiah Franklin. Benjamin Franklin discontinued his education at the age of ten; this did not hinder his inner desire to be great. He later worked for his brother James who was a printer in one of the firms in Boston. Franklin was employed as a nominal editor. After a disagreement with his brother, Ben ran away to New York and later to Philadelphia. This incident happened in October 1723. While in Philadelphia, Benjamin set up his printing house, this is where he printed his first recognized work in history called ‘The Pennsylvania Gazette.’ His autobiography is all about the records of his successes, failures, famous quotes, beliefs and life experiences that he went through his entire life. But the question is what inspired Benjamin to do the things that he did during his time? For example, what inspired him to establish a public library in Philadelphia? And what was the effect of this library on Franklin and his community? This account of his life happened at Passy in Paris in the year 1784 (Franklin p.43). It was after Benjamin had received letters of request, and he could not get a grip of what had already been written. In his autobiography, Ben explained the account on how he started the library. 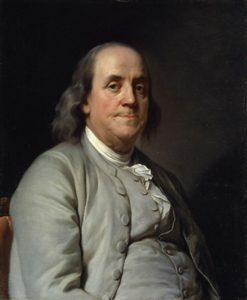 Based on his words, Benjamin said that the library started from a small beginning, and it grew to be very considerable in Philadelphia (Franklin p.56). On the account, Benjamin admitted that by the time he established himself in Pennsylvania, there was no good bookseller shop that people at Philadelphia could depend upon. He also admitted that the printers in New York and Philadelphia only sold papers (Franklin p.61). Book lovers were forced to send out for books from England. Then, Benjamin suggested to Junto members that they should bring their books to the room where they had hired for their meetings (Franklin p.101). After bringing all the books, members of the club were supposed to borrow books they wished, so that they can read at home. Later after seeing the benefit of the book collection, Benjamin suggested that they consider the public and make it a public subscription library. Benjamin and the team then came up with a sketch of plan and rules that would govern the library. They hired Mr. Charles Brockden, who was a skilled conveyance for that job (Franklin 102). There was a fee that the fist purchaser was supposed to pay and an annual contribution for any additional book. Even though there were few readers in Philadelphia, at the time when they begun the public library, the little amount they got, thy imported the books and the library started to function, one day per week. Benjamin’s effort to establish the library was not wasted; it manifested its utility. The first effect of the library is that other town and provinces borrowed the idea. Other places imitated that idea and opened other public libraries. More libraries were opened, and people could get access to books (Franklin p.112). Another effect was that book donors came up, and the libraries were foiled with books from donors. In his words, Benjamin said that reading became the fashion of the day. Most people diverted their attention and leisure time to reading and studying (Franklin 113). But the greatest effect and impact that was caused by that library is that most people were acquainted with books and that generation was more knowledgeable and intelligent than any other people of the same rank in other countries. Franklin did not just made strands by establishing a public library; he also had a quest for moral perfection. In his quest for moral perfection, he was able to convince both the bold and the intellect with his project (Franklin 120). Franklin wished that he would live his life without committing any fault. He was convinced to do this by all means and natural inclination even if it would cause him to lose his friends. His thoughts could not accept the fact that one can either be wrong or right, he believed that a person can do well and avoid wrong. But in his words, he also admitted that he had undertaken one of the greatest tasks in trying to prove moral perfection (Franklin p.120). Benjamin concluded that in his quest to do right, the wrong always surprised him. He talks about habits taking advantage of the good intentions, and this he said, was too strong for reasoning. Benjamin also concluded that even if we have the drive to be virtuous, that does not stop one to slip. Therefore, he believed that every wrong habit must be broken and new and good one to be acquired and embraced for one to be dependable and steady (Franklin p.120). He then comes up with a method that was to help him prove his philosophy. In his readings, Benjamin has come across various moral values that he incorporated them in his catalog. Benjamin then came up with a list of thirteen moral values that he promised to undergo the test by himself. He then purposed that until he has attained one of the virtues in the list, is when he will proceed to the next (Franklin p.121). He made a book where he allotted the virtues and marked his progress. The result was a success because; he noticed a big change in his personal habits. The most challenging virtue to maintain was temperance. Temperance deals with eating and drinking habits (Franklin p.122). He could find that he has already gone against this habit even without his conscious. But another question that one may ask after reading this autobiography is what does “a speckled ax is best, mean? This quote is derived from a short story of a man who bought an ax from a Smith. The ax was supposed to be grinded every time and then after being used but the man did not do so and at the end he desired the speckled ax (Franklin p.96). Therefore, Benjamin likened it to most people who desired to break bad habits but find it hard to go through the process. Henceforth, this saying means that most people would like to have good habits but in the long run, they give up at the process of discipline. They then end up settling for mediocre virtues. Reason being, those who press on for good morals, end up to be hated and envied by their friends. Benjamin Franklin was a very religious man because he associated his prosperity with the blessings of God. In his autobiography, Benjamin speaks a lot about God. He said that one ought to give thanks to God for giving them life and comfort (Franklin p.106). He was religious because, with all humility, he owes his happiness and success to God’s kind provision. He also talked about the punishment of God to offenses (Franklinp.107). Also, Benjamin was a religious man and for that matter a Christian, the reason being he quotes a lot of Holy Scriptures in his writings and his beliefs and arguments were inspired by the scriptures. For example, he quotes Solomon 3:16, 17, whereby he viewed God to be the foundation of all wisdom (Franklin p.108). Benjamin believed in one God who created all things. He concluded that God will reward good virtues and punish bad habits. Franklin, Benjamin. The Autobiography of Benjamin Franklin, 1706-1757. Bedford, Mass: Applewood Book, 2008. Print.